Derry City had to settle for a 1-1 draw with Premier Division basement club Athlone Town at the Brandywell. City made a slow start and Athlone capitalised with Derek Doyle's shot hitting both posts before going in. Derry came into the game and Ryan McBride saw his header cleared off the line before Rory Patterson levelled with a half-volley on 30 minutes. Patterson and Michael Duffy were denied by the woodwork in the second half as Athlone held on for a point. 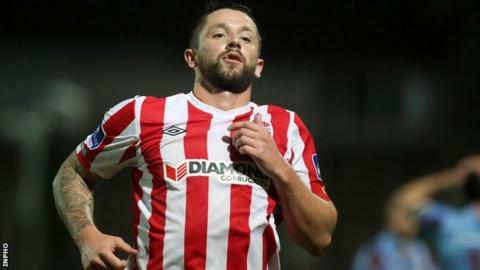 Candystripes boss Peter Hutton put out a strong City team, resisting the temptation of resting key players ahead of next weekend's FAI Cup semi-final against Shamrock Rovers. The hosts were lacklustre early on and Doyle put the visitors ahead with a cool finish from Sean Brennan's throughball. Derek Prendergast made the goal-line clearance from McBride's header before striker Patterson hit the net after Athlone failed to clear a Stephen Dooley cross. Derry pressed in the second half and Patterson fired against a post after his initial shot was kept out by keeper Ryan Coulter. Duffy was next to miss out for City as he also hit a post from a Patterson cut-back and the midfielder squandered a late opportunity by firing wide with just Coulter to beat. Derry remain sixth in the standings while Athlone stay bottom but they are now just a point behind UCD.